Think immigration is too high in Europe? If so, do you know how many foreigners do you think live in your country? The numbers may be far lower than you think. 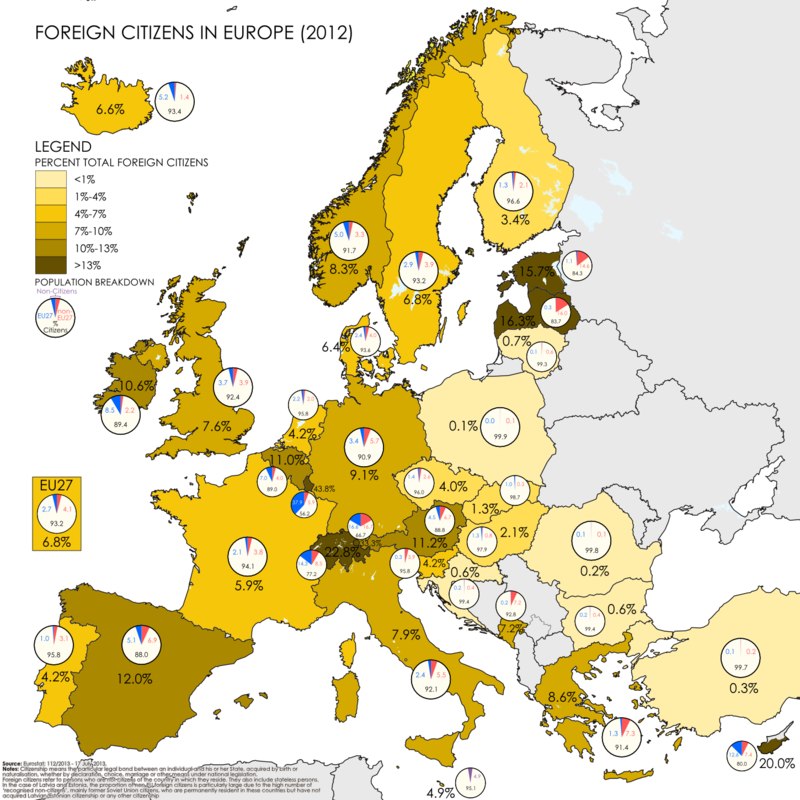 The map above shows the percentage of the foreign citizens (split between EU and non-EU nationals) living in many European countries. While the media loves to portray the continent as being overrun with foreigners, the truth is quite different. 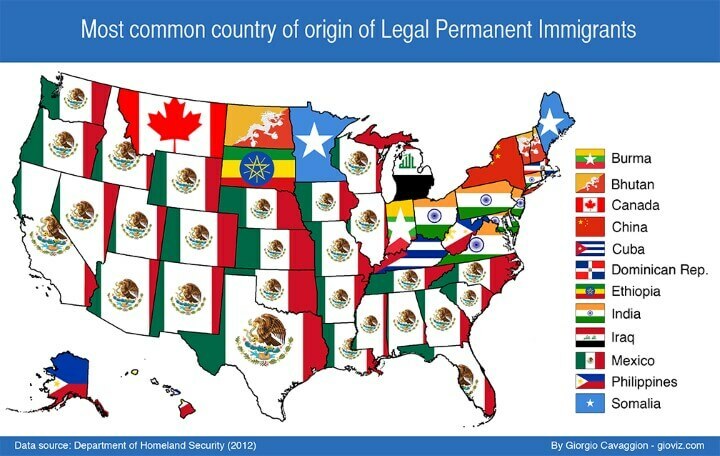 Inspired by Ben Blatt’s What are the biggest immigrant groups in your state?, Giorgio Cavaggion created two flag maps of the most common country of origin of new legal immigrants to the United States. 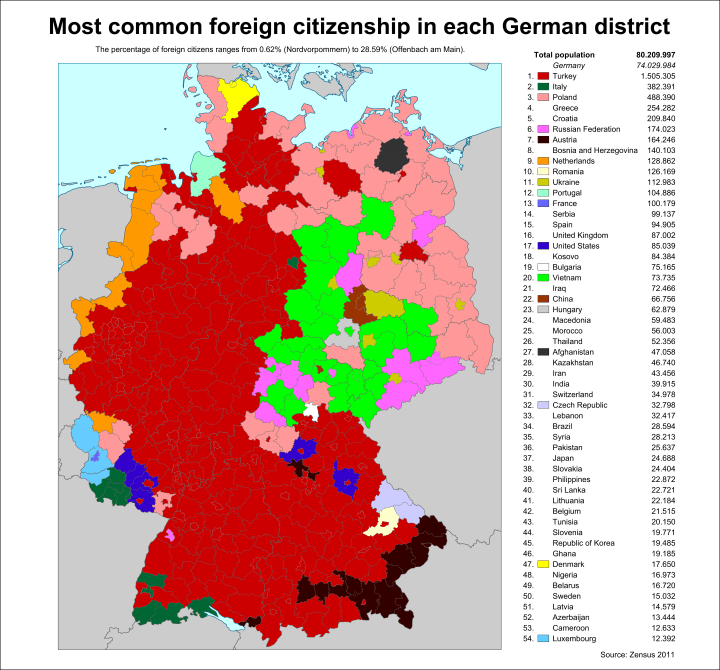 The map above shows the country of citizenship for the largest group of foreigners by German district. However, it doesn’t show the absolute or even relative numbers. So even districts with very few foriegners will still have one group that’s the largest. In total, Germany had 6,180,013 people with non-German citizenship living there in 2011, according to zensus2011.de. The map above shows the flag of the country people who move abroad are most likely to move to. So for example, Australians are most likely to move to the United Kingdom (and vice versa), Canadians are most likely to move to the United States, Mainland Chinese to Hong Kong, etc. The UN estimates that there were 232 million people living outside their country of birth in 2013, roughly 3.2% of the world’s population. To put this in perspective, if migrants formed one country, it would be the world’s 5th most populous. The map above uses the UN’s Trends in International migrant stock: By destination and origin report to look at the most popular destination for migrants FROM each country.